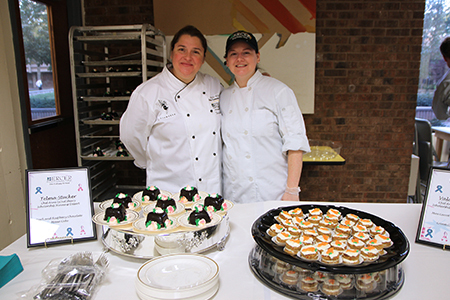 Scholarship recipients Telma Stucker, left, and Valarie Herbe with their award-winning desserts. From left, Don and Lillie.Widmayer, David Lumberger, MCCC Chefs Doug Fee and Frank Benowitz, scholarship recipient Telma Stucker, Dean of Buisness and STEM Winston Maddox and scholarship recipient Valarie Herbe. Students from HOS102 (Applied Kitchen Skills) served multiple dishes including beer-battered crab balls, pork dumplings and roasted duck. 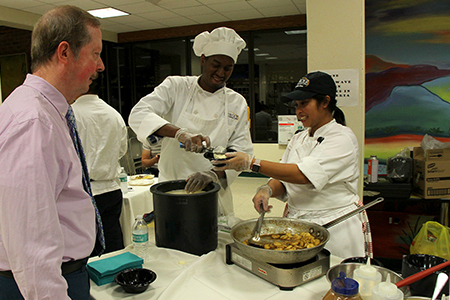 Bananas Foster was served up to order by the MCCC Hospitality Club. One of the highlights was the drawing of Tricky Tray winners. Participating restaurants donated gift certificates in addition to cooking up much of the evening's feast. 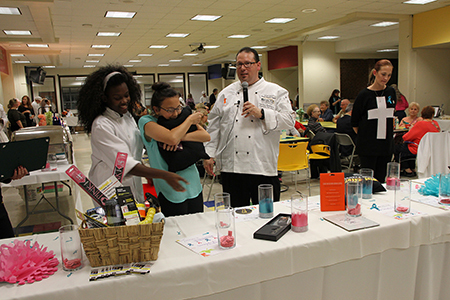 West Windsor, N.J. – More than 100 food enthusiasts came out to enjoy a tasting experience that has become a signature event for the Hotel, Restaurant and Institution Management (HRIM) program at Mercer County Community College (MCCC). Now in its third year, the MCCC Culinary Tasting Benefit held on Oct. 12 featured dishes prepared by close to 20 area restaurants and food service companies, along with five classes of MCCC culinary students. The event originated in 2014 as a way to pay tribute to two special chef instructors, the late Anne Lumberger and the late Shari Widmayer. It has grown into a veritable feast of haute cuisine, comfort foods, ethnic dishes and delectable desserts prepared by professional chefs, chef instructors and culinary students. Many of the participants and guests have ties to MCCC that go back decades, including those who earned their culinary degrees at the college and/or studied under Chefs Lumberger and Widmayer. A highlight of the evening was the awarding of the Chef Anne Lumberger and Chef Shari Widmayer Pastry Arts Memorial Scholarship to student Telma Stucker for her dark and raspberry chocolate mousse cake, 80 of which she prepared and hand-decorated in a seven-hour labor of love for guests to enjoy. The scholarship runner-up was student Valarie Herbe, who also prepared close to 100 of her award-winning mini-carrot and zucchini cakes with cream cheese frosting. Presenting the scholarships were Chef Doug Fee, HRIM program coordinator, and Chef Frank Benowitz, who serves as the advisor for the Hospitality Club. Both chefs expressed their gratitude to all the organizations and individuals who took part, as well as the many guests who supported the event. “We host this event to ensure that the memories of Chefs Lumberger and Widmayer will live on at our college and in our students. 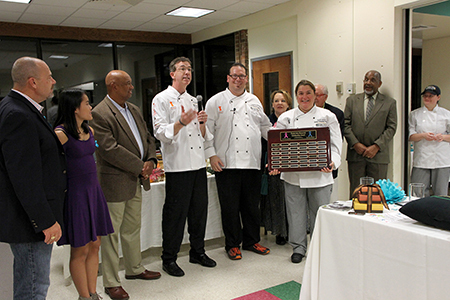 By presenting scholarships in their names, their dedication and passion to teaching their craft continues,” Benowitz said, adding that scholarship winners' names are added to a plaque that hangs in the Culinary Center. The event raised approximately $6,000 for the scholarship fund. The participating restaurants and food service companies included Agricola (Princeton), Anjappar Chettinad South Indian Cuisine (North Brunswick), Blend/Brothers Pizza (Hamilton), Blue Bottle Café (Hopewell), Eno Terra (Kingston), Jersey General Salsa Company, Jersey Girl Café (Hamilton), Nassau Inn (Princeton), Palace of Asia (Lawrenceville), Ravello by Toscano, Stone Terrace by John Henry, Small World Coffee (Princeton), Stone Terrace by John Henry’s (Hamilton), The Gingered Peach (Lawrenceville), Terra Momo Bread Company (Princeton), Trattoria Procaccini (Princeton) and Wegmans (Princeton). 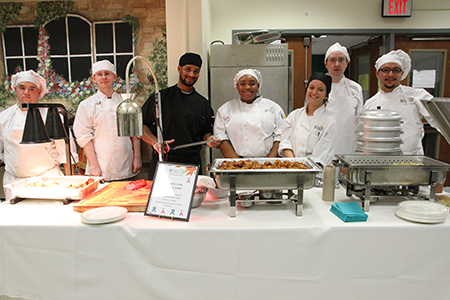 MCCC students prepared a variety of sushi, a whole salmon, pork dumplings, a roasted duck carving station, Bananas Foster, and trays of madeleines and rainbow cookies. Guests also had the opportunity to participate in a silent auction and raffle prize drawing for gift certificates and other items donated by participating organizations. The Chef Anne Lumberger and Chef Shari Widmayer Pastry Arts Memorial Scholarship Fund continues to accept donations. Gifts may be made online by visiting www.mccc.edu/give, or with a check to the MCCC Foundation, P.O. Box 17202, Trenton, NJ 08690 made payable to: MCCC Foundation, with “Chef Anne Lumberger and Chef Shari Widmayer Scholarship Fund” noted on the memo line.